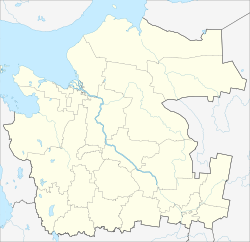 Arkhangelsk (Russian: Арха́нгельск, IPA: [ɐrˈxanɡʲɪlʲsk]), also known in English as Archangel and Archangelsk, is a city and the administrative center of Arkhangelsk Oblast, in the north of European Russia. It lies on both banks of the Northern Dvina River near its exit into the White Sea. The city spreads for over 40 kilometers (25 mi) along the banks of the river and numerous islands of its delta. Arkhangelsk was the chief seaport of medieval and early modern Russia until 1703. A 1,133-kilometer-long (704 mi) railway runs from Arkhangelsk to Moscow via Vologda and Yaroslavl, and air travel is served by the Talagi Airport and a smaller Vaskovo Airport. As of the 2010 Census, the city's population was 348,783, down from 356,051 recorded in the 2002 Census, and further down from 415,921 recorded in the 1989 Census. The arms of the city display the Archangel Michael in the act of defeating the Devil. Legend states that this victory took place near where the city stands, hence its name, and that Michael still stands watch over the city to prevent the Devil's return. Vikings knew the area around Arkhangelsk as Bjarmaland. Ohthere of Hålogaland told circa 890 of his travels in an area by a river and the White Sea with many buildings. This was probably the place later known as Arkhangelsk. According to Snorri Sturluson, Vikings led by Thorir Hund raided this area in 1027. In 1989, an unusually impressive silver treasure was found by local farm workers by the mouth of Dvina, right next to present-day Arkhangelsk. It was probably buried in the beginning of the 12th century, and contained articles that may have been up to two hundred years old at that time. Most of the findings comprised a total of 1.6 kilograms (3.5 lb) of silver, largely in the form of coins. Jewelry and pieces of jewelry come from Russia or neighboring areas. The majority of the coins were German, but the hoard also included a smaller number of Kufan, English, Bohemian, Hungarian, Danish, Swedish and Norwegian coins. It is hard to place this find historically until further research is completed. There are at least two possible interpretations. It may be a treasure belonging to the society outlined by the Norse source material. Generally such finds, whether from Scandinavia, the Baltic area, or Russia, are closely tied to well-established agricultural societies with considerable trade activity. Alternatively, like the Russian scientists[who?] who published the find in 1992, one may see it as evidence of a stronger case of Russian colonization than previously thought. In the 12th century, the Novgorodians established the Archangel Michael Monastery (named after Michael the Archangel) in the estuary of the Northern Dvina River. The main trade center of the area at that time was Kholmogory, located 75 kilometers (47 mi) southeast of Arkhangelsk, up the Dvina River, about 10 kilometers (6.2 mi) downstream from where the Pinega River flows into the Dvina. Written sources indicate that Kholmogory existed early in the 12th century, but there is no archeological material to illuminate the early history of the town. It is not known whether the origin of this settlement was Russian, or if it goes back to pre-Russian times. In the center of the small town (or Gorodok) that is there today is a large mound of building remains and river sand, but it has not been archeologically excavated. In 1411, Yakov Stepanovich from Novgorod went to attack Northern Norway. This was the beginning of a series of clashes. In 1419, Norwegian ships with five hundred soldiers entered the White Sea. The "Murmaners", as the Norwegians were called (cf. Murmansk), plundered many Russian settlements along the coast, among them the Archangel Michael Monastery. Novgorod managed to drive the Norwegians back. However, in 1478 the area was taken over by Ivan III and passed to the Grand Duchy of Moscow with the rest of the Novgorod Republic. Three English ships set out to find the Northeast passage to China in 1553; two disappeared, and one ended up in the White Sea, eventually coming across the area of Arkhangelsk. Ivan the Terrible found out about this, and brokered a trade agreement with the ship's captain, Richard Chancellor. Trade privileges were granted to English merchants in 1555, leading to the founding of the Company of Merchant Adventurers, which began sending ships annually into the estuary of the Northern Dvina. Dutch merchants also started bringing their ships into the White Sea from the 1560s. Scottish and English merchants also traded in the 16th century; however, by the 17th century it was mainly the Dutch that sailed to the White Sea area. In 1584 Ivan ordered the founding of New Kholmogory (which would later be renamed after the nearby Archangel Michael Monastery). At the time access to the Baltic Sea was still mostly controlled by Sweden, so while Arkhangelsk was icebound in winter, it remained Moscow's almost sole link to the sea-trade. Local inhabitants, called Pomors, were the first to explore trade routes to Northern Siberia as far as the trans-Urals city of Mangazeya and beyond. In December 1613, during the Time of Troubles, Arkhangelsk was besieged by Polish-Lithuanian marauders commanded by Stanislaw Jasinski (Lisowczycy), who failed to capture the fortified town. In 1619 and in 1637 a fire broke out, and the complete city was burned down. In 1693, Peter the Great ordered the creation of a state shipyard in Arkhangelsk. A year later the ships Svyatoye Prorochestvo (Holy Prophecy), Apostol Pavel (Apostle Paul), and the yacht Svyatoy Pyotr (Saint Peter) were sailing in the White Sea. However, he also realized that Arkhangelsk would always be limited as a port due to the five months of ice cover, and after a successful campaign against Swedish armies in the Baltic area, he founded St. Petersburg in May 1703. Nonetheless, Akhangelsk continued to be an important naval base and maritime centre in the Russian north. In 1722, Peter the Great decreed that Arkhangelsk should no longer accept goods that amounted to more than was sufficient for the town (for so-called domestic consumption). It was due to the Tsar's will to shift all international marine trade to St. Petersburg. This factor greatly contributed to the deterioration of Arkhangelsk that continued up to 1762 when this decree was canceled. Arkhangelsk declined in the 18th century as the Baltic trade became ever more important. In the early years of the 19th century, the arrest and prolonged detention by Russian authorities of John Bellingham, an English export representative based at Arkhangelsk, was the indirect cause of Bellingham later assassinating British Prime Minister Spencer Perceval. Arkhangelsk's economy revived at the end of the 19th century when a railway to Moscow was completed and timber became a major export. The city resisted Bolshevik rule from 1918 to 1920 and was a stronghold of the anti-Bolshevik White Army supported by the military intervention of British-led Entente forces along an Allied expedition, including a North American contingent known as the Polar Bear Expedition. It was also the scene of Mudyug concentration camp. During both world wars, Arkhangelsk was a major port of entry for Allied aid. During World War II, the city became known in the West as one of the two main destinations (along with Murmansk) of the Arctic Convoys bringing supplies in to assist the Soviet Union. During Operation Barbarossa, the German invasion of the Soviet Union in 1941, Arkhangelsk was one of two cities (the other being Astrakhan) selected to mark the envisaged eastern limit of Nazi control. This military operation was to be halted at this A-A line but never reached it as the German forces failed to capture either of the two cities and also failed to capture Moscow. Arkhangelsk was also the site of Arkhangelsk ITL, or the Arkhangelsk Labour Camp, in the 1930s and 1940s. Today, Arkhangelsk remains a major seaport, now open year-round due to improvements in icebreakers. The city is primarily a center for the timber and fishing industries. On March 16, 2004, fifty-eight people were killed in an explosion at an apartment block in the city. Arkhangelsk is the administrative center of the oblast and, within the framework of administrative divisions, it also serves as the administrative center of Primorsky District, even though it is not a part of it. As an administrative division, it is, together with five rural localities, incorporated separately as the city of oblast significance of Arkhangelsk—an administrative unit with the status equal to that of the districts. As a municipal division, the city of oblast significance of Arkhangelsk is incorporated as Arkhangelsk Urban Okrug. The mayor (as of July 2017) is Igor Viktorovich Godzish, who was elected in 2015. Nordavia (formerly Aeroflot Nord) airline has its head office on the grounds of the Talagi Airport in Arkhangelsk. Arkhangelsk was home to Pomorsky State University and Arkhangelsk State Technical University which merged with several other institutions of higher learning in 2010 to form the Northern (Arctic) Federal University. Arkhangelsk is also home to the Northern State Medical University, Makarov state Maritime Academy,and a branch of the All-Russian Distance Institute of Finance and Economics. Mikhail Lomonosov came from a Pomor village near Kholmogory. A monument to him was installed to a design by Ivan Martos in 1829. A monument to Peter the Great was designed by Mark Antokolsky in 1872 and installed in 1914. After its historic churches were destroyed during Joseph Stalin's rule, the city's main extant landmarks are the fort-like Merchant Yards (1668–1684) and the New Dvina Fortress (1701–1705). The Assumption Church on the Dvina embankment (1742–1744) was rebuilt in 2004. In 2008, it was decided that the city's cathedral, dedicated to the Archangel Michael, which had been destroyed under the Soviets, would be rebuilt. The foundation stone was laid in November 2008 by the regional Bishop Tikhon. The cathedral, situated near the city's main bus station and river port, is expected to be completed and consecrated in 2019. 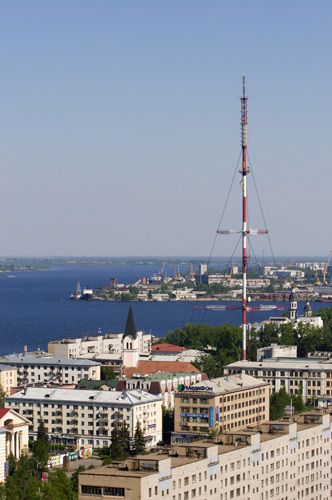 Another remarkable structure is the Arkhangelsk TV Mast, a 151-meter (495 ft) tall guyed mast for FM-/TV-broadcasting built in 1964. This tubular steel mast has six crossbars equipped with gangways, which run in two levels from the central mast structure out to the each of the three guys. On these crossbars there are also several antennas installed (image). An unusual example of local "vernacular architecture" was the so-called Sutyagin house. This thirteen-story, 44-meter (144 ft) tall residence of the local entrepreneur Nikolay Petrovich Sutyagin was reported to be the world's, or at least Russia's, tallest wooden house. Constructed by Mr. Sutyagin and his family over the course of fifteen years (starting in 1992), without plans or a building permit, the structure deteriorated while Mr. Sutyagin spent a few years in prison on racketeering charges. In 2008, it was condemned by the city as a fire hazard, and the courts ordered it to be demolished by February 1, 2009. On December 26, 2008, the tower was pulled down, and the remainder of the building was dismantled manually by early February 2009. An airstrip in Arkhangelsk was the fictional setting for a level in the 1997 hit videogame Goldeneye 007. The Russian North, and, in particular, the area of Arkhangelsk, is notable for its folklore. Until the mid-20th century, fairy tales and bylinas were still performed on the daily basis by performers who became professionals. Starting from the 1890s, folkloric expeditions have been organized to the White Sea area and later to other areas of the Arkhangelsk Governorate in order to write down the tales and the bylinas, especially in Pomor dialects. In the 1920s, mostly due to the efforts of Anna Astakhova, these expeditions became systematic. By the 1960s, the performing art was basically extinct. These folkloric motives and fairy tales inspired the literary works of Stepan Pisakhov and Boris Shergin, who were both natives of Arkhangelsk. Arkhangelsk experiences a subarctic climate (Köppen climate classification Dfc), with long (November-March) and very cold winters and short (June-August) and cool summers. Women costumed as brides in celebration of the 450th anniversary of the founding of Arkhangelsk. Bandy is the biggest sport in the city and is considered a national sport in Russia. Vodnik, the local team, nine times became the Russian champion (1996–2000 and 2002–2005). Their home arena has the capacity of 10000. Arkhangelsk hosted the Bandy World Championship in 1999 and 2003. The 2011–2012 season Russian Bandy League final was played here on March 25, 2012. The 2016 Youth-17 Bandy World Championship was played in Arkhangelsk between 28–31 January. ^ a b Государственный комитет Российской Федерации по статистике. Комитет Российской Федерации по стандартизации, метрологии и сертификации. №ОК 019-95 1 января 1997 г. «Общероссийский классификатор объектов административно-территориального деления. Код 11 401», в ред. изменения №278/2015 от 1 января 2016 г.. (State Statistics Committee of the Russian Federation. Committee of the Russian Federation on Standardization, Metrology, and Certification. #OK 019-95 January 1, 1997 Russian Classification of Objects of Administrative Division (OKATO). Code 11 401, as amended by the Amendment #278/2015 of January 1, 2016. ). ^ Энциклопедия Города России. Moscow: Большая Российская Энциклопедия. 2003. p. 25. ISBN 5-7107-7399-9. ^ a b Информация о мэре города (in Russian). Мэрия Архангельска. Retrieved May 31, 2012. ^ Паспорт города (in Russian). Мэрия Архангельска. Retrieved May 31, 2012. ^ "List of postal codes" (in Russian). Russian Post. Archived from the original on December 12, 2006. Retrieved July 23, 2011. ^ Коды областных центров (PDF) (in Russian). Beeline. Archived from the original (PDF) on November 23, 2011. Retrieved August 26, 2011. ^ "www.arhcity.ru" (in Russian). Мэрия Архангельска. Retrieved May 31, 2012. ^ "Archangel: Heraldic Argument in Russia". The Baronage Press. ^ Nosov, E.N (1992). "THE ARKHANGELSK HOARD" (PDF). sarks.fi. ^ Жилинский, К. А. (1919). Крайний север Европейской России (in Russian). Кольские карты. Retrieved January 24, 2013. ^ Hill, Alexander (2007). "Russian and Soviet Naval Power and the Arctic from the XVI Century to the Beginning of the Great Patriotic War". The Journal of Slavic Military Studies. 20 (3). ^ "Detroit's Polar Bears and their confusing war". The Detroit News. Archived from the original on July 9, 2012. Retrieved July 12, 2007. ^ Государственный комитет Российской Федерации по статистике. Комитет Российской Федерации по стандартизации, метрологии и сертификации. №ОК 019-95 1 января 1997 г. «Общероссийский классификатор объектов административно-территориального деления. Код 11 252», в ред. изменения №278/2015 от 1 января 2016 г.. (State Statistics Committee of the Russian Federation. Committee of the Russian Federation on Standardization, Metrology, and Certification. #OK 019-95 January 1, 1997 Russian Classification of Objects of Administrative Division (OKATO). Code 11 252, as amended by the Amendment #278/2015 of January 1, 2016. ). ^ Архангельский городской Совет народных депутатов. Решение №88 от 15 ноября 1991 г. «Об образовании территориальных городских округов». (Arkhangelsk City Council of People's Deputies. Decision #88 of November 15, 1991 On Establishing the City Territorial Okrugs. ). ^ "Archangelsk invests in new cathedral". Barents Observer. November 25, 2008. Retrieved January 20, 2015. ^ "Archangel Mikhail Cathedral". Lonely Planet. Retrieved January 28, 2019. ^ Ponomaryova, Hope (June 26, 2008). Гангстер-хаус: Самый высокий деревянный дом в России объявлен вне закона [Gangster house: Russia's tallest wooden house is now outlawed]. Rossiyskaya Gazeta (in Russian). Moscow, Russia. Retrieved August 15, 2009. ^ В Архангельске провалилась первая попытка снести самое высокое деревянное здание в мире [Arkhangelsk The first attempt to demolish the tallest wooden building in the world failed in Arkhangelsk]. NEWSru.com Realty (Недвижимость) (in Russian). Moscow, Russia. December 26, 2008. Retrieved August 15, 2009. ^ mihai055 (December 26, 2008). Сутягин, снос дома [Demolition of Sutyagin's house] (Flash video) (in Russian). YouTube. Retrieved August 15, 2009. ^ В Архангельске разрушено самое высокое деревянное здание в мире [The tallest wooden building in the world has been destroyed in Arkhangelsk]. NEWSru.com Realty (Недвижимость) (in Russian). Moscow, Russia. February 6, 2009. Retrieved August 15, 2009. ^ От самого высокого деревянного строения в мире осталась груда мусора [Only a heap of debris is left from the world's tallest wooden building] (flash video and text). Channel One Russia (in Russian). Moscow, Russia: Web-службой Первого канала. February 6, 2009. Retrieved December 29, 2009. ^ "Weather and Climate-The Climate of Arkhangelsk" (in Russian). Weather and Climate. Retrieved May 13, 2015. ^ "Arhangelsk (Arkhangelsk) Climate Normals 1961–1990". National Oceanic and Atmospheric Administration. Retrieved May 13, 2015. ^ "Russian bandy players blessed for victory at world championship in Kazan". Tatar-Inform. January 21, 2011. Archived from the original on April 24, 2012. Retrieved August 31, 2009. ^ Стадион "Труд", Архангельск (in Russian). Федерация хоккея с мячом России. Retrieved December 1, 2012. ^ "Официальный сайт хоккейного клуба "Кузбасс" (Кемерово) — www.kuzbassbandyclub.ru". Kuzbassbandyclub.ru. November 27, 2011. Retrieved August 15, 2012. ^ "Состав юношеской сборной России (U-17) на ЧМ-2016" (in Russian). Russian Bandy Federation. Retrieved January 20, 2016. ^ Информация о городах-побратимах (in Russian). arhcity.ru. October 26, 2007. Retrieved July 27, 2013. ^ "Ystävyyskaupungit (Twin Cities)". Oulun kaupunki (City of Oulu) (in Finnish). Retrieved July 27, 2013. Архангельское областное Собрание депутатов. Областной закон №65-5-ОЗ от 23 сентября 2009 г. «Об административно-территориальном устройстве Архангельской области», в ред. Областного закона №232-13-ОЗ от 16 декабря 2014 г. «О внесении изменений в отдельные Областные Законы в сфере осуществления местного самоуправления и взаимодействия с некоммерческими организациями». Вступил в силу через десять дней со дня официального опубликования. Опубликован: "Волна", №43, 6 октября 2009 г. (Arkhangelsk Oblast Council of Deputies. Oblast Law #65-5-OZ of September 23, 2009 On the Administrative-Territorial Structure of Arkhangelsk Oblast, as amended by the Oblast Law #232-13-OZ of December 16, 2014 On Amending Various Oblast Laws Dealing with the Process of Municipal Self-Government and Relations with Non-Profit Organizations. Effective as of the day which is ten days after the official publication.). Архангельское областное Собрание депутатов. Областной закон №258-внеоч.-ОЗ от 23 сентября 2004 г. «О статусе и границах территорий муниципальных образований в Архангельской области», в ред. Областного закона №224-13-ОЗ от 16 декабря 2014 г. «Об упразднении отдельных населённых пунктов Соловецкого района Архангельской области и о внесении изменения в статью 46 Областного закона "О статусе и границах территорий муниципальных образований в Архангельской области"». Вступил в силу со дня официального опубликования. Опубликован: "Волна", №38, 8 октября 2004 г. (Arkhangelsk Oblast Council of Deputies. Oblast Law #258-vneoch.-OZ of September 23, 2004 On the Status and Borders of the Territories of the Municipal Formations in Arkhangelsk Oblast, as amended by the Oblast Law #224-13-OZ of December 16, 2014 On Abolishing Several Inhabited Localities in Solovetsky District of Arkhangelsk Oblast and on Amending Article 46 of the Oblast Law "On the Status and Borders of the Territories of the Municipal Formations in Arkhangelsk Oblast". Effective as of the day of the official publication.). This page is based on the Wikipedia article Arkhangelsk; it is used under the Creative Commons Attribution-ShareAlike 3.0 Unported License (CC-BY-SA). You may redistribute it, verbatim or modified, providing that you comply with the terms of the CC-BY-SA.